The title shows that, just as with The Game of Dungeons, "DND" was just a file name, not the game name. If you haven't had a chance to check out the "Data Driven Gamer," it's worth a visit. The author, Ahab, is still building his readership base, much like I was in 2011. He's more expansive in his selection of games than I am, but his particular focus is to analyze the games' quantitative elements, while still supplying a lot of commentary on the qualitative ones. Ahab did a great job in the last couple of years analyzing The Dungeon and The Game of Dungeons, prompting me to go back and win those games. But those contributions pale in comparison to what he did last month. For the first time that I'm aware of, he figured out how to get a version of Daniel Lawrence's DND operating on a VAX emulator. For decades, we've had to reconstruct this missing link between the PLATO Game of Dungeons and the commercial Telengard based on player memories, adaptations, and interpretations of source code. Ahab not only showed the game in action, but he won it and supplied a full set of maps (for one of the three dungeons) as part of the process. His material is key to understanding this particular, peculiar line of CRPGs. Among other things, the ability to actually play this game shows that only the file name was DND; the title was--copyrights be damned--Dungeons & Dragons. Gameplay in the VMS/VAX DND. My graphics are all messed up because of a line feed issue that I can't solve. The dungeon walls don't really look this chaotic. Untangling the history of this particular lineage has been difficult, largely because of horrendous misinformation, much of it perpetrated (or at least not corrected) by Lawrence himself, who died in 2010 at the age of 52. (Among other things, he explicitly designated this page, which is so hopelessly confused I don't know where to begin, as the "official DND site." The authors do deserve credit for aggregating and preserving important files.) To read some sites, Lawrence is the father of the entire CRPG line, having written the first DND as early as 1972--two years before tabletop Dungeons & Dragons! His game was so popular, some articles have alleged, that students at the University of Indiana decided to adapt it as The Game of Dungeons. (Of course, it was the other way around.) Even writers who haven't so thoroughly confused the timeline have accepted Lawrence's assertions that he wrote "his" DND entirely on his own, with no reference to any other game, despite that it clearly borrows elements from the PLATO Game of Dungeons and Lawrence went to a university (Purdue) connected to PLATO. 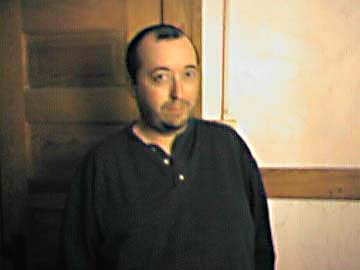 In a 2007 interview with Matt Barton, he suggests that his "play testers" might have played The Game of Dungeons and brought ideas to him. To me, such a scenario doesn't begin to explain the similarities between the games. Daniel Lawrence in an undated photograph. Credit unknown. The best truth that I can determine with the available evidence is that Lawrence wrote his first version of DND in 1976 or 1977, clearly after being exposed to The Game of Dungeons on PLATO. I'm inclined to think that 1977 is the more likely date, since DND is closer in similarity to Version 6 of The Game of Dungeons, which wasn't released until 1977. Then again, elements of The Game Version 8 (1978) also seem to show up in Lawrence's work, so it's possible he went back to the well several times during the development of his adaptation. The existence of several mainframe versions would support this thesis. As we'll see, Lawrence made plenty of additions, and to recognize that he plagiarized from The Game is not to deny his own skill and innovations. His primary contribution was releasing the game to the wider world, first by writing a version for Purdue's DEC RSTS/E system. (In Lawrence's own words, the game was "the cause of more than one student dropping out" and "made me very unpopular with the computing staff at Purdue.") Engineers from DEC maintaining Purdue's system became familiar with the game and liked it so much that in 1979, they asked Lawrence to come to their Massachusetts headquarters and write a port for DEC's PDP-10 mainframe running the TOPS-20 operating system. (There are hints within DEC documents that Lawrence may have been paid for this, and that DEC's intention was to offer the game with its installations. The specific agreement between Lawrence and DEC has not come to light.) This version was subsequently disseminated in many locations where DECs were installed. The VMS/VAX version that Ahab got running seems to have been ported from this mainframe version. By then, Lawrence had already been porting the game to the micro-computer. In 1978, he wrote a version for the Commodore PET that he titled Telengard, which had been the name of one of the explorable dungeons in DND. Representatives from Avalon Hill ran into Lawrence demoing the game at a convention in 1980 or 1981 and offered him a publishing deal, which ultimately saw PET, Commodore 64, Apple II, TRS-80, Atari 800, and MS-DOS releases starting in 1981 or 1982. 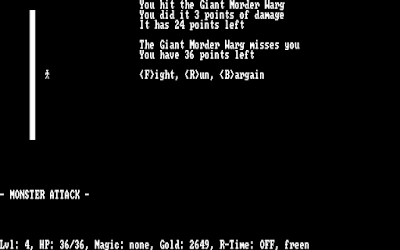 The title screen from the Commodore PET version of Telengard. The 1981 date seems unlikely as the actual release year. In 1981, Lawrence ran a "contest" in which players competed for high scores or other status in some version of DND. Someone from Avalon Hill attended the session, and the result was the commercial Telengard. From then on, Lawrence and Avalon Hill waged war on the ubiquitously-released free versions of the game, ordering their removal from every system on which they appeared. For its part, DEC acceded to legal threats from Avalon Hill, resulting in the modern difficulty reconstructing what those early versions looked like. You can read a long, fun e-mail chain here in which DEC employees try to argue law with their own legal department. Hilariously, various employees request assistance in finding the Orb throughout the thread while their exasperated bosses remind them that the game isn't supposed to exist on any DEC machine anymore. A DEC executive orders the deletion of DND from DEC machines. If Lawrence was guilty of some disingenuous behavior in trying to quash free versions of a game he partly plagiarized, it came back to bite him in repeated plagiarisms of his versions. We've seen plenty of them on this blog, including the so-called "Heathkit DND" (in actuality, also titled Dungeons and Dragons) of 1981, R.O. Software's DND (1984), and Thomas Hanlin's Caverns of Zoarre (1984). There are other BBS and shareware versions of the game that we haven't tried. That's the history. But what is Dungeons & Dragons? 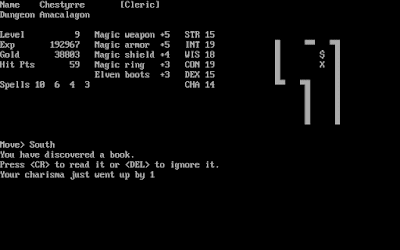 It's a text-based game with ASCII graphics in which a single character navigates one of three 20-level dungeons in a quest to retrieve a magic orb from a dragon. The layout of the dungeon and the locations of many of the special encounters are fixed, but the locations of combats and miscellaneous treasure finds are so random that you could encounter a never-ending stream of them from the same dungeon square. Combats are with a small menagerie of enemies, each with different strengths and vulnerabilities to the game's various spells. The character gains experience through both combat and treasure-finding, with miscellaneous encounters increasing and decreasing his attributes and providing him with magical gear. When he feels strong enough, he takes on the final dungeon level, recovers the orb, and--if he makes it back alive--gets his name on a leaderboard of "orb finders." The basic approach to game mechanics and goals, including the existence of permadeath. The need for a "secret name" is drawn from The Game of Dungeons, but the full set of attributes, the choice of character classes, and the choice of dungeons is new to DND. The number of dungeon levels. A main quest to recover an orb. Carrying treasure out of the dungeon converts it to experience points. My character levels up from a treasure haul. A list of successful characters called "finders." The existence of a transportation device, called "Excelsior," that moves you among the levels. Basic combat options of (F)ight, (C)ast, and (E)vade. A small number of monsters who have numeric levels assigned. Many of the magic items are identical. Items can be trapped (although Lawrence's traps are more creative). Treasure is found in both chests and random piles. Chests contain vastly more gold than the random piles. Magic books that can raise or lower your attributes. DND's handling of chests and books is the same as The Game of Dungeons. Pits that you can fall down, dumping you on lower levels. Luckily, I spotted this one. It's also possible that Lawrence took a few elements from the earlier The Dungeon, including the organization of spells into a number of "slots" per level as well as some of the treasures you can find in the dungeon and their relative conversion to gold. DND has no graphics. Walls and corridors are ASCII characters and the main characters is represented as an X. The Game of Dungeons had graphics for geography, the PC, monsters, equipment, gold, and so forth. Instead of just "gold," the player finds a variety of different treasure types that are converted to gold. DND dungeon levels are much larger. The Excelsior transporter exists on every level in DND, not just the top one. A full set of tabletop Dungeons and Dragons attributes. The Game of Dungeons just had strength, intelligence, wisdom, and dexterity. DND adds constitution and charisma. While the character in Game was a multi-classed fighter/magic-user/cleric, DND has the player specify a choice of these classes. As such, combat is rebalanced so that you don't need to cast particular spells to ensure victory, and a pure fighter has a shot at winning. Spells, which could reliably one-shot certain enemies in The Game, are significantly reduced in power. They're also more in line with tabletop Dungeons and Dragons and, it must be said, a lot less silly than The Game. There's no distinction between experience and gold in DND, as there was in Game through Version 5. The Game also changed to a single experience pool starting in Version 6, so Lawrence may have been influenced by the later one. DND offers three dungeons to explore--Telengard, Svhenk's Lair, and Lamorte--each of which might contain the orb. Game resolved combats all at once. DND shows round-for-round results. DND's approach is generally better, but sometimes you wish it would just hurry up and get it done. DND completely randomizes the appearance of treasure. The Game "seeded" each level with gold and chests whenever you entered, and you could clear the level, but in DND, treasure has a chance of showing up in every square as you move to it, including those you've already explored. DND adds more special encounters at fixed locations, including thrones, altars, fountains, dragons' lairs, and doors with combination codes. Special encounters with altars are a new element in DND. Lawrence replaced the awkward "teleporters" with stairs that remain in a fixed location. DND includes a greater variety of equipment, including magic weapons other than swords. The pluses go much higher, too. Where The Game capped at +3, DND allows higher than +20. DND adds cute atmospheric messages as you explore. Examples: "A mutilated body lies on the floor nearby"; "'Turn back!!!' a voice screams"; "The room vibrates as if an army is passing by." There's even a reference to Colossal Cave Adventure and its hollow voice that says "PLUGH." Telengard has no main quest. The only objective is to get stronger and richer. For years, I thought this was a defining feature of the sub-genre, but it turns out that it's actually quite rare. Most variants have some kind of main quest. Telengard's has only one dungeon, randomly drawn every time you start a new game. Telengard has an expanded selection of items, including potions and scrolls. Telengard is a nicer-looking game, but the greater randomization creates a chaotic experience. Only the last item is a clear "improvement." Telengard is arguably a dumbing-down of gameplay in DND. The lack of any main quest is particularly notable, and one wonders why Lawrence or Avalon Hill made the decision to exclude one. Perhaps they thought the game had greater replayability if the only goal was to create a stronger character. For all the ink writers like me have spent on Lawrence and his game, it arguably had the least impact of the major lineages that began in the late 1970s and early 1980s. During its day, DND offered perhaps the best simulation of the mechanics of tabletop role-playing on a computer, but its arrival on the micro-computer scene was far too late to have any impact. By the time that Telengard was released, it had already been outclassed by Ultima and games in the Moria/Oubliette/Wizardry line. The direct influence of DND can only really be felt in its few clones, for which there was so small a market that they had to be released as shareware. 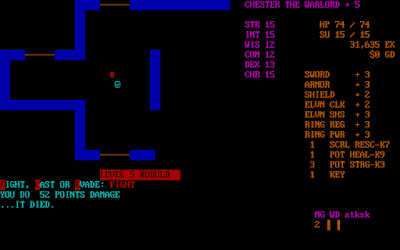 Gameplay from the Heathkit Dungeons and Dragons (1981). There is one small exception, and to analyze it we must first note that DND did a reasonably good job anticipating the roguelike sub-genre. In fact, it's hard not to call it a pre-Rogue "roguelike," what with its random encounters, permadeath, and MacGuffin on the 20th floor. And yet it's hard to detect any direct influence on Rogue. (To some extent, Rogue feels like a game created by someone who heard about DND but never played it.) To my knowledge, the developers of Rogue have never acknowledged any direct influence except Star Trek (1971), Colossal Cave Adventure (1976), and a general desire to emulate table-top role-playing. 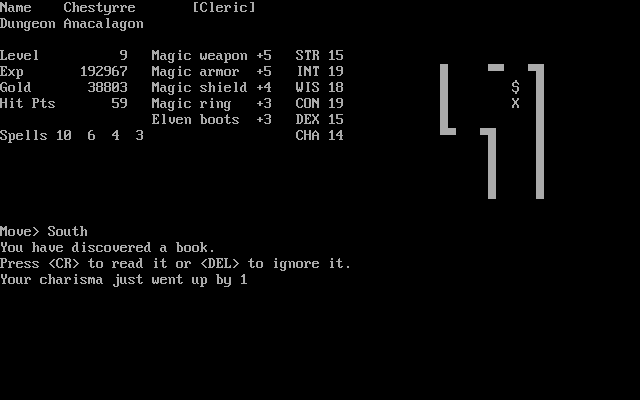 However, I do think that someone on the NetHack development team was exposed to DND, or at least Telengard. 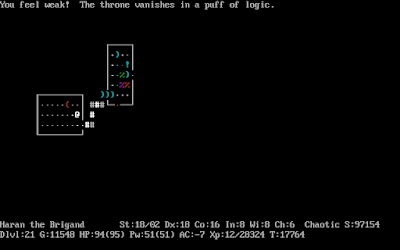 I base this on the variety of special encounters that were introduced to the game at some point between Hack and NetHack 2.3e, including thrones that do different things when you sit on them and offer the ability to pry gems out of them; fountains that have a variety of effects; and altars that ask for money. Granted, thrones, fountains, and altars are fantasy staples that may have been introduced independently, but the specific way that you use them is so similar to DND that I think there must be a connection. It's a minor legacy, but still worth acknowledging. 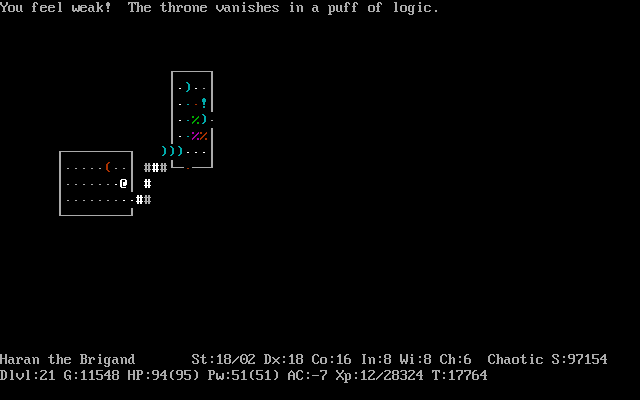 Sitting on thrones in NetHack has many of the same consequences as in DND. Ahab was kind enough to send me the instructions I needed to emulate DND myself. I tried for a while, but I couldn't solve an issue (involving line feeds) that created chaos out of the dungeon maps. (The solution he offers on his blog didn't work for me despite us both having the same version of Windows.) Such a win would have been superfluous coming right on the heels of his own victory anyway. I may return to it at some point in the future, just for the statistic, but not soon. This entry will serve as my final word on this line of games, which we've visited in bits and pieces since the first year of my blog. If any new information comes to light, I'll include edits in this entry rather than writing anew. In the meantime, there are dozens of web pages and Wiki articles that I don't imagine will be similarly corrected. Daniel Lawrence deserves credit for what he accomplished, but he is not the grandfather or even father of CRPGs. Cool post, I love this stuff. Is the family tree exploration stuff something you'd like to do more of, in relation to other lineages? Yes. I was going to make it part of the book if I ever finish it. The BASIC source code contains pretty specific dates in its versions headers. They are not entirely clear, but I see no reason to doubt them. The headers date back to May 1976, with changes made by Lawrence up to 1978. After that, other people made mostly bugfixes and ports, though someone seems to have rewritten the combat system... John Rich added an operator mode in 1984. That's the BASIC version that you can download on the "official" DND page. Chuck Cranor made a Unix/C port which is also available on the DND page. It looks like a straight port of the BASIC version - it also contains the operator mode, and variable names and program structure have been taken from the BASIC version (the C version is much more readable, though). The C version compiles and runs easily under Linux, and with a few fixes and the help of Cygwin I got it to compile and run natively under Windows 10. If you want I can provide you with this version. It looks pretty much like your screenshots (without the layout bug). There is one major difference - UDND contains a different set of dungeons, Crestwood and Sire's Hole. Dunno about anyone else, but I'd love a Windows build of the game. Wow, VMS. That takes me back. Years ago I managed a server running that. It's weird to think that it actually had games that would run on it. I'm in touch with someone who claims to have a printed copy, but I'm not sure if he's ever going to be in a good position to scan it. But he also thinks that the Internet is wrong and M199h post-dates both pedit5 and dnd. Keep us posted if you ever hear more... that would be a very interesting part of the origin of CRPGs to know more about! Wonderful post. It's always so great to see concrete, accurate information win the day over received wisdom and fudged half-truths. I love these posts, too. I have a feeling a lot of what you find on the topic on the internet is just derived from Matt Barton's book, which is fine, but it means errors and inaccuracies will be copied, too. Matt's writing a second edition, and I don't know if he'll change anything about his DND coverage or not. (And to be fair, the only thing that I would consider "wrong" in the book is a statement that Lawrence's DND is "not to be confused with" the PLATO dnd.) He's in a tough spot. On the one hand, there's a lot of smoke that points to plagiarism. On the other, a developer told him to his face that he hadn't referenced any previous game. And when that interview took place, the capability wasn't there to get a Cyber1 account and check things out for yourself, which isn't something you should have to do anyway. Also, *I* think Lawrence was lying, but not everyone has to subscribe to my interpretation. I can see why you'd want to favor the explicit recollections of one of the original authors. Well, clearly elements from the Plato game got into Lawrence's DND. But it could be that he just misremembered, 30 years is a long time. I have one correction: The Jim Burrows you mention as a DEC executive is actually an engineer - he is the one responsible for the Pascal port of DND. There's a facebook post by him that explains how the DND ban at DEC happpened. It sounds like the ban was more due to the DEC lawyers being afraid of an unwritten NDA than an actual legal threat from Lawrence or Avalon Hill. I mean, it's probably not for historians to resolve the discrepancy on the evidence available. It's enough to say "Lawrence says X, but if so then the following similarities involve a truly staggering level of coincidence." And let the reader draw the fairly obvious conclusion themselves. The next mystery I would like to see solved is what connection Rogue has, if any, with the PLATO games. There's a nice page that visualises influences between roguelikes. It lists Lawrence's DND as an implied influence, but I'm not sure what this is based on. Most similarities can probably be explained by the common Dungeons and Dragons roots and by the terminal interface. We'd have to hear from the authors to be sure, but they were about as far away from PLATO as you can get. I suspect Rogue was a wholly original concept. Thanks for the endorsement (and the traffic)! I started Data Driven Gamer less than a year ago and I'm still finding my groove, but I've always been a chronology nut, and a very big fan of data. Some 15 years ago I decided to organize my backlog and play chronologically, and it only seems to have grown faster than I could finish them. From there, a lot like what you did in 2011, I decided to go all in on the backlog, fill it with nearly everything I might ever want to play, and leverage that into something people might enjoy reading. DND's dungeons are also randomly seeded with both monsters and treasure. With a light spell or torch, you can see them appear on the map on tiles adjacent to you. Monsters also randomly appear with every step you take, and sometimes drop treasure when killed, but you won't find random loose treasure except on seeded tiles. 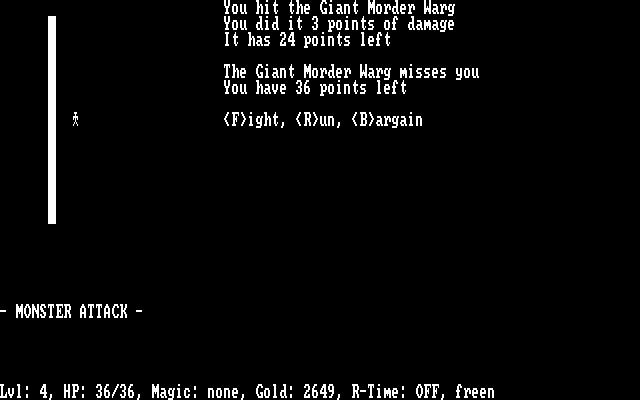 Telengard's dungeon, at least in its 1981/1982 PET incarnation, is not random (just procedural), and you'll never find things like thrones, fountains, and altars without exploring. Someone actually made an interactive map of that monstrosity. Wow, that title sounds a bit pretentious to me now. I meant it more as MY final word on DND. At least I took it as your final word, before moving to another subject. You say: "A full set of tabletop Dungeons and Dragons attributes. The Game of Dungeons just had strength, intelligence, and dexterity. DND adds constitution and charisma." The screenshot right after this shows Wisdom as well. So DND added wisdom as well? No, GoD had wisdom. I'm not sure why I didn't include it in the list. If it came about after pedit5... then we can rest assured about the very first CRPG! I wish I could be of more help. I first encountered *a* D&D-based game on PLATO in 1976, but I couldn't tell you the lesson name. I first played Rogue around 1981. It went through changes around 1981-1982, including adding archery IIRC. Initially you might find a bow or crossbow somewhere and one arrow or bolt somewhere else; the ammunition was too rare to be useful. In later versions, you could find 3-8 arrows, and that became a major factor in game play. The two turns to equip a bow and later re-equip your mace were too expensive, so I usually just threw arrows at things; if you had high STR, they did a fair amount of damage.